(Phys.org) —Move over, Matrix - astronomers have done you one better. 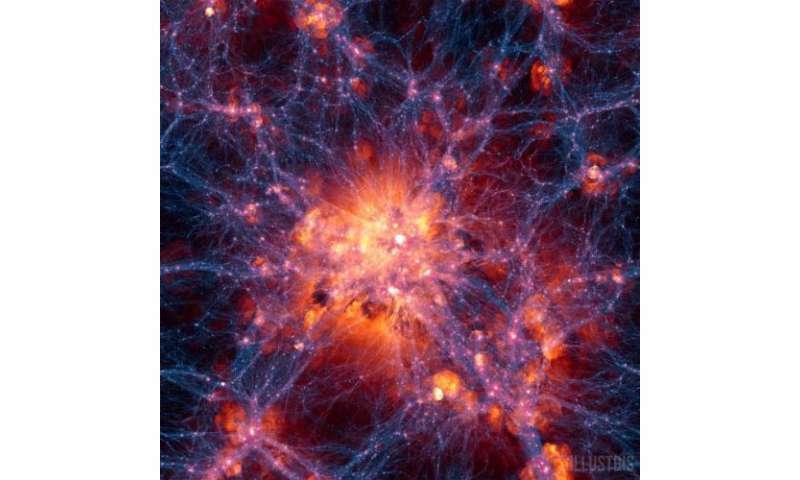 They have created the first realistic virtual universe using a computer simulation called "Illustris." Illustris can recreate 13 billion years of cosmic evolution in a cube 350 million light-years on a side with unprecedented resolution. "Until now, no single simulation was able to reproduce the universe on both large and small scales simultaneously," says lead author Mark Vogelsberger (MIT/Harvard-Smithsonian Center for Astrophysics), who conducted the work in collaboration with researchers at several institutions, including the Heidelberg Institute for Theoretical Studies in Germany. These results are being reported in the May 8th issue of the journal Nature. Previous attempts to simulate the universe were hampered by lack of computing power and the complexities of the underlying physics. As a result those programs either were limited in resolution, or forced to focus on a small portion of the universe. Earlier simulations also had trouble modeling complex feedback from star formation, supernova explosions, and supermassive black holes. 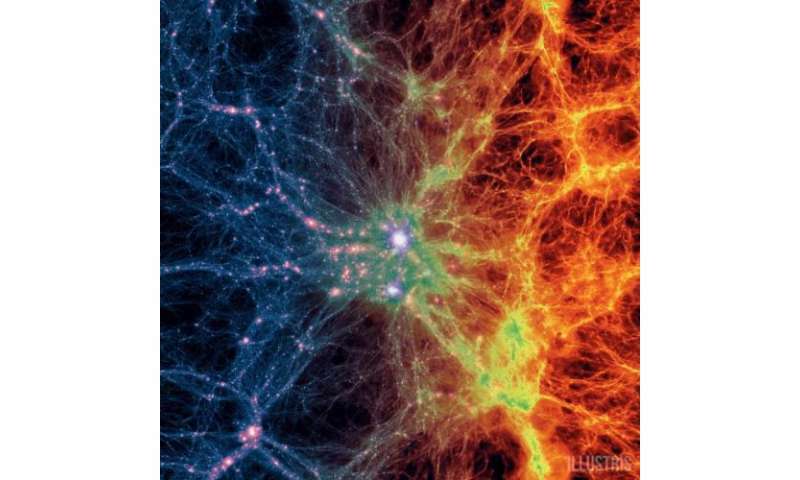 Illustris employs a sophisticated computer program to recreate the evolution of the universe in high fidelity. It includes both normal matter and dark matter using 12 billion 3-D "pixels," or resolution elements. The team dedicated five years to developing the Illustris program. The actual calculations took 3 months of "run time," using a total of 8,000 CPUs running in parallel. If they had used an average desktop computer, the calculations would have taken more than 2,000 years to complete. The computer simulation began a mere 12 million years after the Big Bang. When it reached the present day, astronomers counted more than 41,000 galaxies in the cube of simulated space. Importantly, Illustris yielded a realistic mix of spiral galaxies like the Milky Way and football-shaped elliptical galaxies. It also recreated large-scale structures like galaxy clusters and the bubbles and voids of the cosmic web. On the small scale, it accurately recreated the chemistries of individual galaxies. Since light travels at a fixed speed, the farther away astronomers look, the farther back in time they can see. A galaxy one billion light-years away is seen as it was a billion years ago. Telescopes like Hubble can give us views of the early universe by looking to greater distances. However, astronomers can't use Hubble to follow the evolution of a single galaxy over time. "Illustris is like a time machine. We can go forward and backward in time. 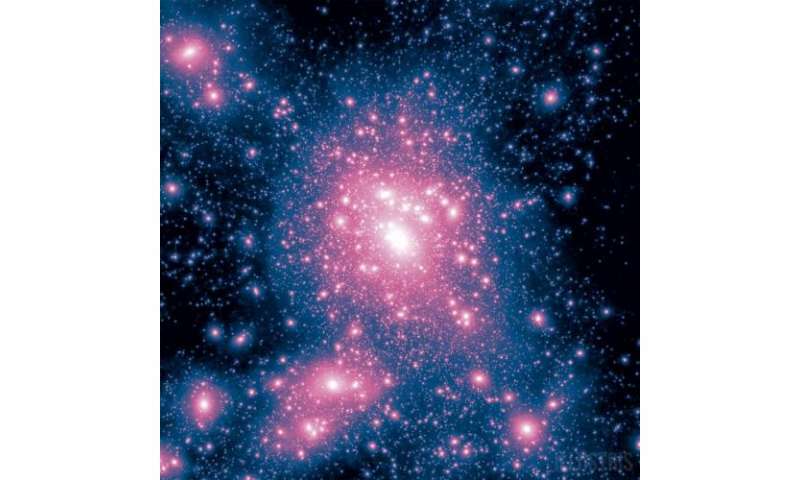 We can pause the simulation and zoom into a single galaxy or galaxy cluster to see what's really going on," says co-author Shy Genel of the CfA. Wow, it's remarkable how far our tools have come, and how well our models fit what we observe. This is a really unique result. I'd love to see where the simulation gets to 13 billion years from now or further (where our models start to break down a bit more). A thought, I don't know one way or the other whether they addressed it: In principle, orbits release energy through gravitational radiation, and orbits should decay over long lengths of time. I don't know if those effects are so small they're negligible on these scales, but would a simulation on into the future (maybe a 100 bn year simulation, or a trillion year simulation or some higher order of magnitude) include these effects? Would we see galaxies shrink as orbits decay and bodies fall in toward the center? How many bodies, on average, escape their galaxy altogether? This article is just too neat to be spoiled by trolls. Please, let's just ignore them for now. Downvote their comments and move on. That is one sweet simulation. That it hits so close to the mark is really encouraging we're on the right track. Beautiful. This would be an ideal candidate for a distributed computing project on BOINC (e.g. like Seti@Home) to expand the simulation over time without escalating supercomputer costs. I'm not sure this could be done on such a setup. SETI@home is possible because you can work on chunks of data independent of other chunks of data. Simulations like the one in the article are highly interdependent and require a large amount of inter-process communication. If you do that sort of communication over the internet (with the added complication that people might switch their machines off at unpredictable times for unpredictable intervals) then you'd bog the simulation down to the speed of the slowest/most infrequently available machine. There are no really 'correct' models - there never can be. There are only models that are OK and some that are better. Finding a better model does not make the old model worse. That we can use the current crop of models to get good results on those time (and space) scales is amazing. Remember that Relativity didn't come about as a completely new theory. It builds very solidly on all the older models. And the epicycle model isn't wrong, it is just more cumbersome (and increasingly so the larger the system you model). The force equations also look rather complicated beyond the most simple applications...and it really gets complicated once you add relativity into the mix. It's not wrong but it's not the model of choice for many reasons. Wow, it's remarkable how far our tools have come, and how well our models fit what we observe. One has to remember that these models contain some 97% of dark matter and dark energy, which are basically just huge wildcards because nobody knows what they are and how they actually do what they do. So what do the models really prove? Not much, really. It's the unknown part that is really driving what the universe is doing, and not the part that we can observe. It's like watching chinese theater where men in black unitards move objects around a dimly lit stage. Let see, DM was proposed in the 1930's. Not before the 1980's, AFTER the filamentary universe was discovered, that there was ever even a consideration or model that proposed DM would be arranged in this manner. Once again the standard model (SM) was retrofitted and adjusted a posteriori to fit the observation. Alfven on the other hand PREDICTED before the space age that the universe would be arranged in a filamentary and cellular manner. It just goes to show how the SM is ultimately adjustable in it's fiction. I don't think it proves or disproves anything either. One must admit, it is pretty cool to watch. I wonder how many times the simulation has been run and what sort of variations have appeared. If the same pattern repeats the model may be missing some of the randomness of the universe. If the epicycle model was good and plausible in its era, what was actually wrong with attitude of people, who downvoted the Galieo? It was bit of a problem with 'divine circles' and various ideas of humano-centricism. Whenever you run up against something that is divine, holy, revealed truth, etc. you run up against people willing to be illogical. If a power base is built up on such a view (as all religions are) then you get violent reactions. It was not a scientific conflict of theory X vs theory Y. It was a conflict of theory X against papal self-claimed infallibility. Are we predestined to repeat this history again like sheep or could we learn something deeper from it for future? We have learend. Theory must now be backed by experiment. "Theory by authority" is no longer the way science is done. Not before the 1980's, AFTER the filamentary universe was discovered, that there was ever even a consideration or model that proposed DM would be arranged in this manner. Nope. Filamentary structure wasn't discovered until the later half on the 1980's but the stringy structure was already predicted in very early N-body simulations in the early half of the 1980's and the late 70's. Pure physics, no backwards engineering. The standard model also predicted Baryon Acoustic Oscillations decades before that was confirmed. Alfven's model didn't. Standard cosmology predicted Gunn–Peterson troughs and the Sunyaev–Zel'dovich effect, both decades in advance. The later of which thoroughly debunks Alfven's idea that the CMB was non-cosmological. Is the simulation of theory such an experiment? Since it is then compared to observation: yes. but the opposite situation can be still possible. Only if you posit VASTLY more complex mechanisms (and you also need to argue why the simpler mechanisms shouldn't be correct). That something is possible doesn't mean it's probable. The universe, as we see it, could POSSIBLY just be chance. No laws at all. Neither gravity nor EM nor anything - all just pure random. Is it probably? Hell, no. You only go back to an improbable theory if the easier one throws a cog and the improbable one doesn't (!). Most of the pictures people see from the telescopes that aren't artist's renditions are not in the visible range. They are colorized. It's plain nutty to think an imitation of a fake photo is good model of reality. Is the decay of light wave with vacuum fluctuations (analogous to scattering of ripples at the water surface simple enough mechanism? Just because something is simple doesn't mean it's right. "You are smart". Simple statement. But utterly wrong. It must be complex enough top encompass observable facts. Your 'theory' is not. Whereas at the case of tired light model we already have all necessary effects observed. Yes -and all the observations say: It's a wrong theory. So why cling to it? Just because it's simple enough for your simple brain to get a hold on? If something doesn't work and you stick to it then that's not science - that's religion. But this has been explained to you and yourinfinitely many sockpuppets before. Go talk to your sockpuppets.